Apple has just released Watch OS 1.0.1 software update for Apple Watch and it is now available for download. 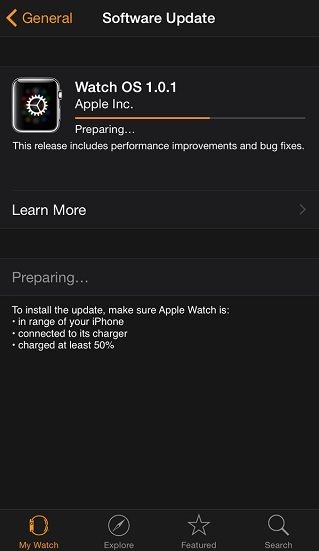 The update can be downloaded and installed from the Watch app found on the iPhone. According to the description of the update it mainly focuses on performance and bug fixes. The change log mentions performance improvements for features like Siri, third-party apps and different health features. The update also brings display support for new emoji characters. Support for new languages has also been added to Watch OS, which now also supports Brazilian Portuguese, Danish, Dutch, Swedish, Russian, Thai and Turkish. The health features that have received performance boost include Watch’s ability to measure standing activity, calculating the calories for cycling and rowing activities, measuring distance and pace for walk and run workouts. Those of you who have an Apple Watch can install the update by opening the Apple Watch app on the connected iPhone and by going to General > Software Update. There you simply have to tap on ‘Download and Install’ button. Before you can install the update your Apple Watch should be in range of the iPhone, have at least 50 percent battery left and it should be connected to the charger.